with a blue enamel finish. The top bar bears the date "1965"
On the ribbon is a beautifully enamelled plaque, which bears the name of the Lodge "Alliance Masonic Lodge No. 466" on the circumference thereof. 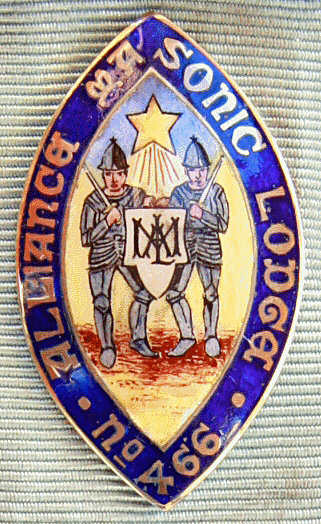 On the centre of the plaque is a picture of a shining star above two Knights carrying swords over their shoulders, holding a shield with the letters "AML" (Alliance Masonic Lodge) superimposed on each other. The Jewel comprises of a normal Compass and Square with a suspended "G". Short History of Warrant No. 466. Warrant No. 466 issued to brethren in the 58th Foot, later the 2nd Battalion The Northamptonshire Regiment on the 2nd February, 1769. The Grand Lodge Minute of 5th December, 1816 notes - "Peter Kerr holds warrant 466 formerly held in 58th Foot. Desires to revive same at ARDLOHER, Killeshandra, Co. Cavan. Deferred." Bro. Kerr sent Warrant No. 466 in on the 18th June, 1817. Grand Lodge granted permission for the revival of Warrant No. 466 and a Duplicate of Warrant No. 466 was granted for ARDLOHER, County Cavan, but never issued. History of Alliance Lodge No. 466. "29 September, 1919 - Read Memorial from Bros. Irwin, Yarr, Stanfield and others praying for a warrant to establish a Lodge in Belfast to be called the Alliance. Recommended." The Recommendation of The Board was followed, as is shown in the Grand Lodge Minutes of 2nd October 1919 as "Confirmed"
Warrant No. 466 reissued to `Alliance Lodge' in BROOKVILLE Masonic Hall, ANTRIM ROAD, BELFAST on the 8th October 1919. Series four Vol. 16 shown as Volume 4a of the extant Grand Lodge Registers shows Robert J. Irwin, Manager (345); William H. Yarr, Cashier (345) and John A. Stanfield, Prop. J. Milliken & Co. (667) registered along with fourteen others from various Lodges on the 8th October, 1919. Alliance Lodge No. 466 was Constituted on Tuesday 25th November, 1919. There were seventeen Foundation Members, W. Bro. R.J. Irwin the first Master. Bros. W.H. Yarr and J.A. 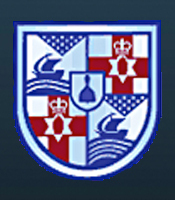 Standfield the Wardens. W. Bro. J. Evans was Treasurer and W. Bro. D.G. Sloan the Secretary. "3 July, 1922 – Read letter from Lodge 466, Belfast for permission to change place of meeting. Permission granted." A total of 52 brethren registered up to 24th April, 1923. In most cases the dates when the issue of certificates is shown, together with the occupation of the brother. Series five Vol. 19 shown as Vol. 3 of the extant Grand Lodge Registers commences with the registration of Ralph S. Sterling, Clerk, registered 28th November, 1925. A total of 65 brethren registered up to 13th December, 1951. In most cases the dates when the issue of certificates is shown, together with the occupation of the brother. Bro. J.G.E., Representative, registered on the 24th February, 1953. A total of 41 brethren registered up to 20th April, 1983. In most cases the dates when the issue of certificates is shown, together with the occupation of the brother. "13 May, 1982 – The Board considered request from Lodge 466 to change its place of meeting from Belfast to Carnmoney, which request was unanimously granted." Warrant No. 466 was removed to CARNMONEY, Co. Antrim on the 13th May, 1982. "Warrant No. 466 to Belfast (Scored out) Carnmoney, Co. Antrim (Meeting place changed, approved by G.L. B. of G.P. 13 May, 1982 as “Alliance Lodge”. "15 November, 1984 – The Board noted with regret and report to Grand Lodge the decision of the Brethren of Alliance Masonic Lodge No. 466, Belfast to hand in the Warrant." The last registration of Officers is shown as 1984. Warrant No. 466 was handed in to the Grand Secretary's Office on the 12th November, 1986.